The battle raged for hours as men fired shots amidst the fog of the morning rising off the land. As they slowly advanced through the hedgerows, the enemy was pushed farther from the front line, bearing casualties along the way. Brave and courageous, our men fought and died on that foreign soil to preserve our freedom and liberty. When the battle was over, an eerie silence descended upon the land as the armies moved on. They say dead men tell no tales, but the troops who fought and died that day told their stories to the men of the Graves Registration Service. These men cared for our honored war dead and the German war dead, to preserve their dignity and handle a task their family members could not. It is due to their tireless efforts that so many of our men and women were identified and with great solemnity and reverence, laid to rest. The Graves Registration Service (GRS) is part of the Quartermaster's Office in the Army. Handling the war dead is not something that was discussed very publicly then or now. There are few books written by former GRS workers that provide the real-life and often grotesque details of handling our Soldier Dead. Yet this is an area that should be discussed and written about in our family histories when we talk about those who died in service. The GRS has a long history dating back to 1862 when Congress gave the President authorization to create permanent American military cemeteries. This act gave the President the ability to seek and purchase land for these cemeteries. In 1867 Congress gave the Quartermaster General in the U.S. Army the responsibility of establishing permanent military cemeteries, handling burials, keeping records, and handling ongoing maintenance of these cemeteries. The Quartermaster handled the war dead from the Civil War, Spanish-American War and World War I. When the U.S. entered World War II, one thing they were determined to do was not establish thousands of small cemeteries. Instead, they planned to establish several cemeteries near the active front and would bring Soldier Dead to these cemeteries. Collection points would be established so the combat units could assist in the collection and identification of Soldier Dead. The GRS men found that if identification could take place near the battlefield and using the unit stationed there, that there was a higher chance of positively identifying the Soldier Dead. When the unit had moved on and no one was available to help identify the dead, sometimes they were brought to the collection points and cemeteries as unknowns. 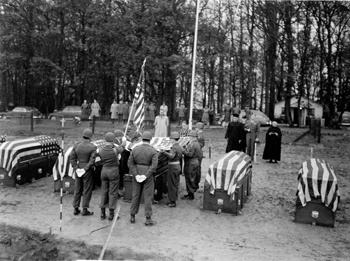 The GRS in World War II were not only responsible for collecting, identifying, and burying the Soldier Dead, but also handling personal effects. The men had a system by which they worked on the stripping line to handle effects so they would be returned to the owner's family. The job of a GRS man was not glamorous. GRS workers were responsible for locating suitable cemetery sites. They examined the terrain, soil quality, and distance to enemy lines. Upon selection of a site, they plotted the cemetery. Maps were drawn, processing tents were set up and the men assigned tasks. Local civilian workers were called in to dig graves and bury the dead. Unsung heroes, these men worked tirelessly to care for the remains of not only our U.S. Soldier Dead but also enemy dead. Within practically every U.S. established cemetery, there was a section for German dead. Our GRS men worked to identify every casualty they buried. The information on enemy dead was given to the foreign government after the war. Why were both U.S. and enemy dead were buried in these temporary cemeteries? Why did the German army not handle its own war dead? It was important to bury all the dead primarily for health concerns. Decomposing bodies out in the open spread disease and lowered troop morale. It was better that the troops didn't encounter the remains of Soldier Dead very often, lest the fear and panic they already felt increase, making them unable to do their job effectively. There was also the respect for the families back home. Our Soldier Dead made the ultimate sacrifice for their country. They deserved the respect of those who cared for them after death since their families could not. Soldiers were buried for forensic reasons also. Information was gathered from the Soldier Dead to not only identify them but also gather information on how they were killed. Finally, GRS buried for political reasons to show both allies and enemies we have a heart, are human and care for others with compassion. GRS claimed the remains of Soldier Dead from a unit, along the road side or battle ground. They worked on both sides of enemy lines in the mud, rain, deep snow, jungles and on beaches in their recovery efforts. During the recovery process, both complete bodies and scattered remains were recovered. Think about this for a moment. Most likely a complete body or set of remains may have been a soldier who was shot in the head or chest. Now think about the men hit by shells. These remains may have been scattered around the area in which they were killed. Now consider that the GRS men could not always attend to the dead immediately after they were killed. In those cases these men encountered all stages of decomposition. Families learning about their Soldier Dead always asked, "Where are his personal effects?" Families wanted every piece of their soldier they could get both as a way to remember and hold them and grieve for them. Unfortunately there were sometimes very few effects to ship home to the family. Families were not told that the soldiers carried very little that was theirs on their person. They did wear identification tags and may have carried wallets, rings, insignia, letters, photos, and money, but little else that was theirs. What happened to the things they carried? The enemy may have picked items off the dead. They may have sold or given away their watches and such. Friends may have taken an item off their dead buddy for safekeeping. Or it may have been destroyed when the soldier was killed. Effects recovered were bagged and sent to Kansas City, Missouri for disbursement. They were cleaned of blood and grime. It was then determined if the effect should be returned to the family. In some cases, things were not sent to the family. For instance, if letters from a girlfriend were found on a soldier and his service record indicated he was married, those letters would have been destroyed. When a soldier was located after death, every attempt at identification took place. The exact process, forms that were completed, and repatriation procedures will be examined in Part II of this article. For now I leave you with some resources on the Graves Registration Service. Shomon, Joseph James. Crosses in the Wind. New York: Stratford House, Inc., 1947. Sledge, Michael. Soldier Dead. How We Recover, Identify, Bury, and Honor Our Military Fallen. New York: Columbia University Press, 2005. Torrance, Duncan Leitch. Desert to Danube. Northumberland TD: Duncan Leitch Torrance, 2010. NOTE: Photo courtesy of the American Battle Monuments Commission. Richardson, Eudora Ramsay, and Allan, Sherman, Quartermaster Supply in the European Theater of Operations in World War II Volume VII Graves Registration (Camp Lee, VA: The Quartermaster School, 1948),1.